A decidedly feminine, modern floral fruity fragrance. Alber Elbaz was inspired by Lanvin’s historical bottle, creating a startling gown of glass and silk tulle. A particularly couture detail is the pale pink grosgrain label, much like those that adorn the dresses of the collections. The ultimate touch of elegance, this exceptional bottle is crowned with a chrome-ringed stopper, stamped with the seal of Lanvin. A modern and daring fragrance, Jeanne Lanvin, is deliberately gay, floral and luscious, with its joyful notes of raspberry and blackberry, underscored by delicate musk. Jeanne Lanvin elegantly and lightly embodies the Lanvin woman, who is decidedly young and romantic. This item is sold by Lanvin SG and fulfilled by our delivery providers. 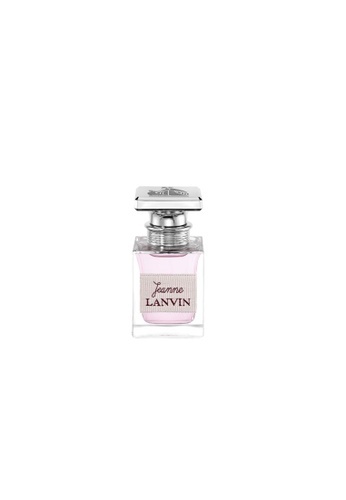 Can't find Lanvin Jeanne EDP 30ml in your size?